This article appeared in The Windsor Magazine sometime in early 1898. It is by Charles Cathcart. A bitter, north-easterly gale, accompanied by blinding sleet and snow, was sweeping over Primrose Hill as my dripping hansom pulled up with a jerk at Madame Beatrice Langley’s comfortable house near Regent’s Park; but before I had been many minutes seated near the blazing fire, sipping tea and listening to the sparkling conversation of my genial hostess, all recollection of the refrigerating process I had just experienced had faded from my mind and my spirits had risen considerably. Indeed, so completely did Madame Langley’s witty comments upon all sorts and conditions of men and matters engross my attention, that fully half an hour must have passed before we came to actual business. 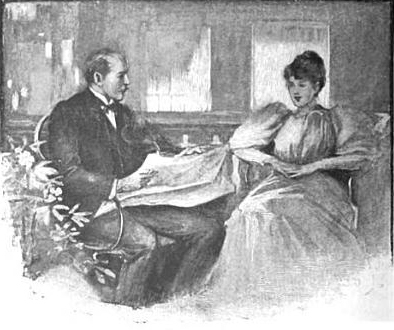 “Only three days before!” Madame Langley answered, with a look of amusement. She is the wife of Mr. Basil Tozer, a prolific writer of newspaper articles and the author of several books on sport. We continued our conversation, and I soon gathered that my hostess entertained the highest opinion of Madame Albani, not only, of course, as an artist, but as an individual. Incidentally, too, she let fall a remark that I have heard made before, a remark to the effect that Madame Albani seems never to say an unkind word about anybody, but that she is, on the contrary, ever on the look-out for talent, and ready to help any young artist in whom she discovers the germs of genuine merit. Now, oddly enough, from what I am told about Madame Langley herself, and from what I saw of her during my brief visit, I should say that the selfsame remark might truly be applied to another lady. Upon the subject of musical agents and musical managers Madame Beatrice Langley waxed eloquent. With but one exception, she personally has been fairly treated, though she prides herself upon never in her life having asked for an engagement either for a concert or for “at homes,” at which latter she plays largely. Madame Langley is an enthusiastic Wagnerian, and seldom misses an opportunity of being present at a Wagner concert. Also she is interested in politics, and, besides being a lover of art, she is an omnivorous reader, and appears to be thoroughly posted in topics of the day and well abreast of current literature. “Would you care to see my fiddle?” my fair hostess asked presently, as she refilled my cup. I replied that I should like, not merely to see it, but to hear it, whereupon she favoured me with Bach’s famous “Aria,” played most exquisitely on her favourite violin, a Maggini, which her father, Colonel Langley, late of the Royal Artillery, gave her as a wedding present. This was the violin which she took to Canada. As Maggini died in the year 1630, the fiddle must be at least 267 years old; nevertheless, it is in perfect condition. 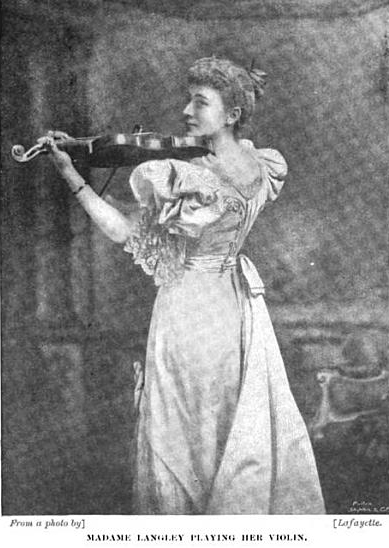 Madame Beatrice Langley is, I believe, the only woman violinist in London who has ever played in public the difficult A minor variations of Paganini. Her tone is quite wonderful, and, listening to her playing, one could almost imagine her Maggini was a ‘cello. During her absence from the room for a few minutes, I glanced through her albums of Press notices, truly a marvellous collection of unanimously favourable criticisms, and presently I came across one in particular that I well remembered having read before. It was taken from the Times of January 2nd, 1897, where, under the heading “Music of the Year,” Madame Beatrice Langley’s name is coupled with that of Sarasate. 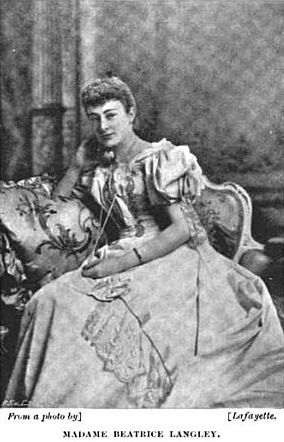 According to the Times, Sarasate, Ysaye, and Madame Beatrice Langley were “among the most successful violinists who appeared during the year.” Among the Canadian newspaper cuttings I noticed one that tempted me to ask Madame Langley rather a personal question as she re-entered the room. “Are you a Romanist?” I ventured to inquire. I remarked that “Mr. Beatrice Langley” must be wise in his generation, and soon afterwards I took my leave.